DIAMONDS AND BARS: THE ART OF THE AMISH QUILT, DieNeue Sammlung (the State Museum of Applied Art and Design), Munich, Germany, 2007. English language discussion by Laura Fisher. HOME SWEET HOME: THE HOUSE IN AMERICAN FOLK ART; Deborah Harding and Laura Fisher, Rizzoli International Publications, New York, NY, 2001. 160 pages, 150 full color illustrations, $50 hardcover. Out of print; Available through amazon.com; at Borders and selected booksellers, and from Laura Fisher. The charming ways that buildings have been depicted in American folk art are captured in Home Sweet Home. Quilts, coverlets, shirred, yarn-sewn and hooked rugs, paintings and drawings, samplers and needlework, furniture, furnishings, toys and accessories are discussed by the authors based on extensive research and interviews with folk art experts. The homes and buildings shown in each medium include icons of American folk art along with images that have never before been published. Writing in Antiques and the Arts Weekly, Laura Beach reported, "…the images in Home Sweet Home cleave into groups…in the first, the depictions of home are essentially records…like portraiture. In the second group, home is a semi-abstract motif symbolizing security, stability, and belonging, values that transcend architectural specifics and that are fundamental to traditional vernacular art." 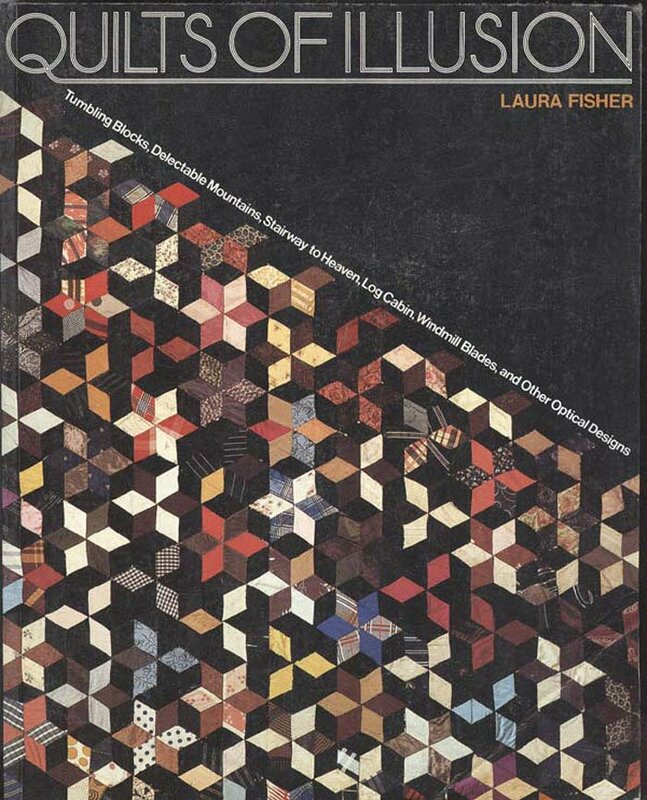 QUILTS OF ILLUSION, Laura Fisher, Sterling/Main Street Press, New York, NY, 1989 (soft cover), and Blandford Villiers House, London, 1990 (hard cover). Optical illusion design in antique quilts is explored in depth in this breakthrough work published in the U.S. and England. Whether an unanticipated consequence or a planned design, each illusionary quilt is intriguing. The graphics found in the nearly 200 examples have mystery, depth and movement. Many look remarkably modern yet most are 100 to 175 years old. Instructions with templates to create four quilts are included. Out of print; a few signed soft cover American version and hard cover English version copies are available from Laura Fisher; can sometimes be found through used book dealers. AMERICA'S GLORIOUS QUILTS, Duke and Harding, Editors, Hugh Lauter Levin, New York, NY, 1988. The first "coffee table" book showing antique quilts as the works of art and history they are, in glorious color and in significantly large scale. Fisher wrote the introductory chapter that discusses the variety to be found in antique quilts, and contributed to essays throughout. Out of print; copies sometimes available through used book dealers. “FOR ALL IT’S WORTH” the antique quilts appraisal column in The Quilt Life Magazine published by the American Quilter’s Society, Paducah, KY, ongoing. To subscribe. contact thequiltlife.com. QUILTMANIA,a French patchwork magazine available in English, with features on the latest designs and patterns, instructional articles, technique tips, ideas for decorating with quilts,antiques, and event information. Fisher is a regular contributor, most recently the article MALE ENHANCEMENTS: Suit-able Quilts, about the use of menswear woolens in antique quilts. Always check periodicals including MARTHA STEWART LIVING; ARCHITECTURAL DIGEST, COUNTRY LIVING and other home furnishings, shelter, and lifestyle magazines and on- line design blogs for gallery pieces in interiors, and for Fisher’s commentary on textiles and collecting.